OK, I've been lurking, researching, and asking questions for more than a year. Its probably time I had a build thread. I got started on this path last spring while researching overlanding vehicles on the Expedition Portal forum. I stumbled across Tom's "Astrolander" van, and a light-bulb went on. I considered other options, like a crew-cab truck with a Flip-Pac shell, or slide-in camper, but I kept coming back to how much I liked Vans. I grew up camping in a '67 VW Westy, sometimes with half a dozen kids sleeping in, on, and around it, so I knew that a camper van would be a good fit for my growing family. I really liked the idea of a sportsmobile, but that was cost prohibitive, and Tom has proved that the Astro/Safari platform can do things larger vans sometimes can't, and can do it more affordably. We welcomed our baby girl last June, which kept us pretty busy for a while, but by September I was ready to start taking action. After an exhaustive search, including monitoring Craigslist feeds from five states, I picked up my 2003 AWD Astro from a used lot in Tucson, AZ and drove her home. We quickly figured out why all of our other baby-having friends have got minivans, its amazing how much stuff baby's need, and hauling it got 1000% easier when the Astro arrived. The budget for the project is tight, so I continue to monitor craigslist and other spots for good deals. 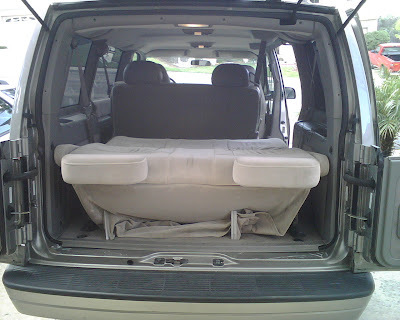 Among them was this sofa bed from a Dodge conversion van. I've been waiting to mount it until I had all the other details sorted out. And this is just about where we stand now. Getting the donor home was an adventure of itself, which is for another post. "My minivan is cooler than your bro-truck"
1995 Safari GTRV Organ donor - gutted and gone. Last edited by Herbie on Thu Jul 01, 2010 5:38 pm, edited 1 time in total. As I said earlier, I've been continually monitoring craigslist far and wide for good deals or other solutions to my project. A few weeks ago, I found a high-mileage and beatup GTRV. 380,000 km (236k miles), and what the seller described as an interior "in need of TLC", but selling for an incredibly low price. 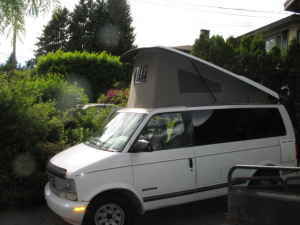 Van was in North Vancouver, but the owner was hesitant to deal with me, he probably thought I was a scammer! Once I explained that I would pay his asking price because the top shell, tent, and other hardware alone were worth that much to me, he agreed to sell. Then it was just a race to get my passport renewed and hope that nobody else stumbled across the advertisement and thought it was as good a deal as I did! So finally, flew into Vancouver last Sunday, took SkyTrain and SeaBus to North Vancouver and met the seller. 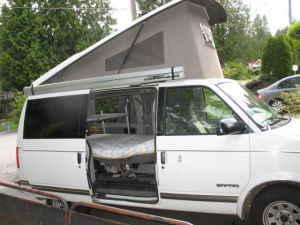 We looked over the van, covered some of the problems, but confirmed that the pop-top and tent are in excellent shape. Concluded the deal and I head for the border. Border line was massive, almost 2 hours just to get to the kiosk so I can get pulled into secondary to start the process of importing the vehicle to the USA. First CBP officer at secondary didn't know as much about vehicle importing as the CBP website (and thus me), so we wasted some time with him telling me I couldn't import the van because the speedo had kph on top. (!!?!) After I insisted that the van had all the proper labelling (CMVSS and EPA labels, etc.) and that it was an HS-7, 2B import, he handed me off to a second CBP officer who within five minutes confirmed that all was well and I was on my way. Made my way into Bellingham and stumbled into the driveway of one T.Low, already besieged by Brian's sportsmobile. Hey, Pop-Top Party!! After comparing Tom's van to mine and the minor evolution of the implementation, we had some decent beer and some grub, all in all a too-short visit. Picked up my co-pilot from the Bellingham airport, gathered a few supplies, and aimed the van south. I have to stop here to thank Tom, Jen, and Brian for such a warm welcome and their fabulous hospitality. By-far the best aspect of the trip was meeting you all and thinking forward about the next visit when we can actually enjoy your beautiful surroundings!! By 11pm, we were on our journey, here's where we started finding some of the "features" of this wonderful machine. First, the instrument lighting in the dash was out. Lots of fun trying to avoid a speeding ticket in an unfamiliar machine on the very-dark northern stretch of the I-5. With the creative use of the map light and/or my ipod, was able to keep tabs on instrumentation until dawn. Door locks are broken in an inconvenient combination of ways (lock cylinder on driver's side, power lock switch on passenger side, etc. ), water temp gauge reads 40c constantly, and a few other niggles. We went straight through, stopping only for bio breaks, fuel, and breakfast. By 10am we were far enough into California that it started to get hot. Real hot. The little thermometer on my REI zipper-pull said 100+. Before 11am. Oh, and the van's AC doesn't work. Crap. Oh well, windows down we soldier on. The upside of our late departure from Bellingham was that we had missed any sort of traffic going through pretty much all of Washington, Oregon, and Northern California. The downside is that we hit central California in the middle of one super-hot day. 105-110 in Sacramento, Bakersfield, etc. By 4:30pm, we were at the base of the Grapevine. Citibank's Fraud Detection division helpfully declined my card at this fuel stop, because they'd noticed what they thought was too many gas purchases. Um, I'm on a roadtrip back from Canada, hello? The guy starts reading off charges in Washington, Oregon, Northern California.... oh, all moving south. Duh. Sorted out that little issue and back on our way. For most of the afternoon, it seemed the Water-temp gauge had been "waking up". It had slowly begun to register, then read near the middle of the gauge. As we got into the serious climb of the grapevine, it started to move more quickly towards the top end of the gauge. I wasn't sure whether I could trust it, but figured discretion was wise so we took a casual pace up the hill. On the descent the gauge settled back to just south of the middle, so we pressed on. Narrowly missed getting stuck in a massive backup due to a recent accident where the passenger and truck routes of the grapevine rejoin, then clean sailing all the way through LA. Somehow we'd timed the drive to miss EVERY bit of rush hour. Entered into San Diego proper by 9pm, dropped off my copilot, and headed for home. Stopped at the store to get some milk, and then.... crank but no fire. 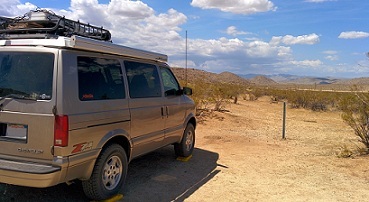 Yep, after 1400+ miles, two countries, three states, and 22 hours, the van has died within two blocks of my house. Oh well, could have been much, much worse. I walked home, took a shower and went to bed. Then I got up and started a new thread here on ASV looking for debug advice. 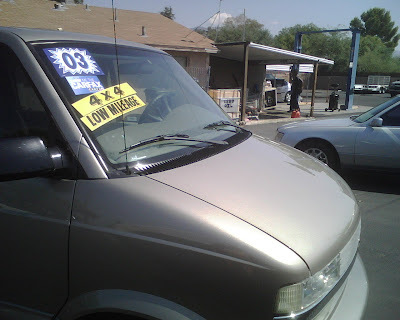 After half a day of checking the easy stuff, the manager of the grocery store in which parking lot the van had died got sort of testy about me crawling around the van checking things, so I just had it towed to my friend's shop. Getting it running would have been convenient, but as it stands is not strictly necessary. Next steps? Start taking pictures and pulling parts. We'll probably start this weekend. It was great meeting you, Mike. Brian had a blast, too. Glad you could stop by. It worked out well for you to visit for a while as you waited for your co driver flying into to Bellingham. Here's to a new blade for the sawzall! Like you basically said, while the van is certainly soggy bread, the stuff you need is in great shape. Your researching efforts paid off big time. Thats an unbelievable find. Amazing you made it all the way home before it pooped the bed 2 blocks from your house. Looking forward to the doco. Church bells ringing in the middle of a gunfight. Amazing you made it all the way home before it pooped the bed 2 blocks from your house. Yeah, I think that was the power of just not stopping much! I can't figure why it would re-start a dozen times at the border, and another dozen times whenever we got gas or food, then finally failed once here, but I'll take it! Awesome story so far Herbie! Dumb luck it died where it did! -74 Ford Bronco -->Far from perfect but mine! -04 Ski Doo REV Summit -->Still several chassis behind! No new projects until the current ones are done! Entered into San Diego proper by 9pm, dropped off my copilot, and headed for home. Whereabouts in SD do you live? I'm not being creepy, just curious. I have family in the La Mesa/El Cajon area. Great story so far Herbie, also good to hear you got a chance to meet up with Tom & Jen and their friend the infamous Brian, looking forward to hearing and seeing more from this project. I am very curious on how the curtains are setup on the GTRV Astro. When you get around to taking pictures, could you take some of the curtain setup? This looks like a really fun project! Rancho Penasquitos, betwixt the 56 and I-15. Very cool adventure, Herbie. Glad it ended well. I will take pictures for more detail, but the curtains are so basic and obvious that I literally smacked myself when I first saw them, since I'm in the middle of doing my own curtain system right now. 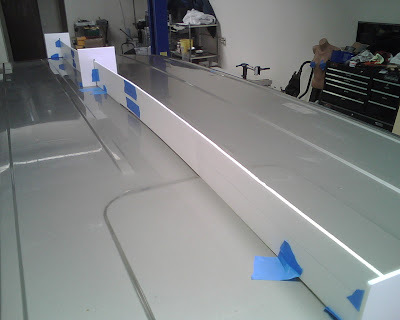 The GTRV curtains are literally this: For each window, there's a hole drilled in the trim plastic at each corner, and an elastic cord is run across the top and bottom, and I assume knotted or otherwise fastened behind the trim. The curtains just slide on the elastic cord. 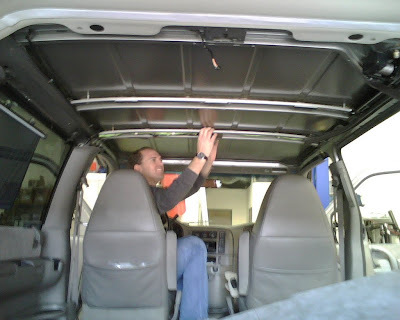 There are tiebacks with velcro attached at a few places in the van, but not every window still has the tiebacks. I can see snaps screwed into the trim at the top of the A- and B- pillars, so I assume that additional curtains were meant to hang there, but they also seem to be missing. I want to know more about this... I've never seen one of these before. These are very cool. 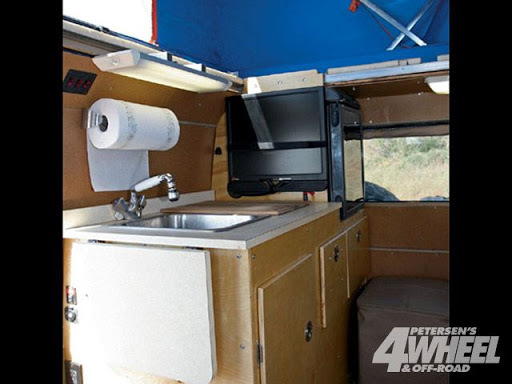 They're roof-top-tents for the "Safari in Africa" crowd, but with a hard fiberglass top and bottom shell. More aerodynamic when closed, and a bit tougher than the all-fabric RTTs. The nice thing is that instead of unfolding, they "pop up". 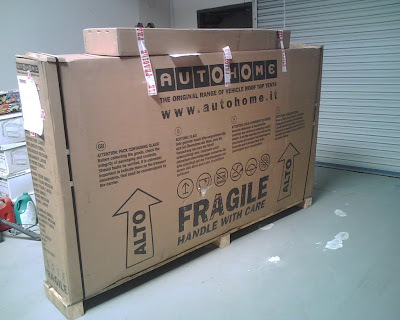 They're distributed by Autohome USA here in the states: http://autohomeus.com and made in Italy. The Airland Small-Extra-Long is just about the perfect width for the Astro, and 90" long, which would basically cover all but the last 10-12" of the roof, leaving room for a small basket or antenna array. Corey, (on Expo, NWOS, FJCruisers) has one andhe is really great at documenting his stuff. Just click on links in his sig. I'm sure there is an entire thread on Expo about the Maggi's. 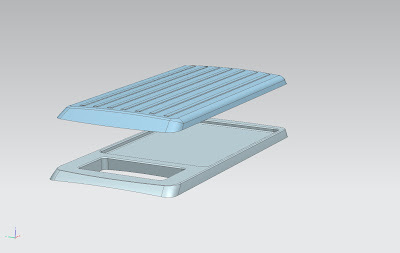 They're a helluvalot cheaper than a pop top, but they're still spendy. 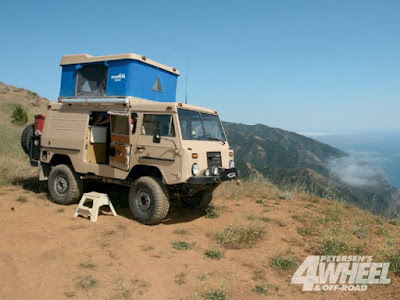 Some of the Roof Top Tents are still $2kplus.